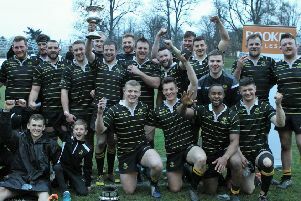 Scott Wight with the Ladies Cup after winning the Melrose sevens with Glasgow Hawks. Top guest teams North West University (RSA), Germany, Glasgow Warriors and Wasps will join 20 Scottish club sides to contest the Aberdeen Asset Management Melrose Sevens on Saturday. Warriors, who last year featured Borders duo Scott Wight and Lee Jones, return to defend their title and, following the success of last summer’s Commonwealth Games tournament, organisers have hinted that an influx of new generation sevens players and supporters could be heading to the Borders this weekend. Melrose sevens, Melrose vs Edin Accies. Melrose Sevens convener Ian Cooper says he is delighted with the calibre of the sides his committee has been able to attract this year. “The 2015 tournament looks like it’s going to be a feast of sevens rugby, he added. “Glasgow Warriors will be challenged by guest sides from North West University (South Africa) and Wasps, as well as the local and national sides. “The national development team from Germany will see the club’s policy of widening sevens participation experience further extended. All at the club are delighted that Aberdeen Asset Management is continuing its support for the tournament, which will celebrate its 125th playing this year. As well as the main event on Saturday, the bumper weekend of rugby in Melrose kicks off with the Davidson Chalmers Vets Tournament tomorrow (Friday). Melrose RFC will again host their popular junior coaching clinic, now in its 32nd year, on Saturday morning. The clinic is set to attract in excess of 100 youngsters under the age of 14 from clubs and schools throughout Scotland who will be put through their paces by some of the country’s top coaches, under the direction of Rob Moffat. Following the success of previous years, an exhibition sevens match will be played featuring Melrose Ladies. This will take place between the semi-final and final of the main tournament. Melrose Ladies currently occupy second place in the RBS Premier One League. Prize money will be awarded as follows: winners – £3,000; runners-up – £1,500; defeated semi-finalists – £1,000 and defeated quarter-finalists – £500. In addition, the winners and runners-up will receive the Ladies Centenary Cup and Sanderson Salver respectively. The charity partner for 2015 is Breast Cancer Care. The tournament will also count towards the AM.PM Event Catering Kings of the Sevens competition. Dundee v Stirling County - winners v Glasgow Warriors.